Muslin Cloth | Wholesale | By the Bale or By the Yard | Canvas ETC. As of late, muslin cloth has been used in a wide range of leisure activities and industries. Muslin is extremely valuable and generally cheap to purchase. Partially due to its availability, muslin has been used in a variety of industries from culinary to film. Muslin was even utilized on the Wright Brothers’ airplane. Muslin’s adaptability and convenience are the attributes that have made it so famous today! What do we know, however, of muslin’s beginnings? Muslin was utilized as early as the ninth century. It may likewise get its name from where early Europeans initially found the cloth. These Europeans found the innovative cloth in Mosul, Iraq. Although the texture was said to have been made in what is currently the capital of Bangladesh, Dhaka. This could be the reason the texture is known as Daka to numerous Islamic locals. Many people believe that the fighters of the first Crusades were who initially took muslin back to Europe from the Middle East. Even Marco Polo expounded on the cloth in his book The Travels. In the 1700’s and 1800’s, muslin was consistently exchanged between the Middle East and Europe. When British Colonialism began, the muslin business did not do to well as the Brits had numerous laws to support British commerce. This prompted the slicing of thumbs to prevent individuals in faraway countries from winding the material. Since then, muslin has made its way back to fame since it is known as being a practical and beautiful material. Individuals have discovered numerous uses for muslin. From culinary utilization, to medicine, and even aviation, muslin has been appeared to be exceptionally adaptable in its uses. Such industries that have put muslin to incredible use are theater and photography. Muslin is frequently utilized for theater sets. There are various motivations to use it for this reason. It can be utilized to cover numerous sets, so an audience can’t see them in the present scene. Muslin can also help create a mood on the set. This material takes paint exceptionally well, so it is an appropriate choice for making scenery. Muslin can even end up translucent if treated appropriately. While Muslin takes paint well, it also takes well to being dyed. This makes it particularly helpful for night scenes. The material frequently looks wavy, and once colored is extremely reminiscent of the night sky. This is a perfect choice for theater directors attempting to reproduce outdoor scenes. Muslin is affordable fabric for productions with a tight budget. Muslin is commonly used in green screens or blue screen film production. The texture can be effortlessly painted with latex paint to make a fantastic background for film creation. Muslin is even utilized as part of present day photography. These settings are painted with dynamic patterns to add depth to pictures. Practice Squares– Many quilting hobbyists use muslin to practice their designs and quilt patterns on. Muslin is much less expensive than other decorative fabrics, so it makes a perfect practice piece. Backing – Many also chose to use muslin as the backing piece to their quilts. Some people want to choose a background that will not distract from the focus of the piece. Muslin also makes for a great supporting fabric. Nostalgia – Muslin was used in older pieces, because it was very affordable and delicate. Now some people choose to use muslin because it has a vintage look and feel to it. Full Quilt – While muslin is sometimes thought of as a “cheaper” material, high quality muslin looks beautiful as a main piece. While some muslin cloths are used simply as a practice sample, many people find that high-quality muslin is an excellent material to make their quilts from. Muslin is a great fabric for several industries. This is because muslin has many advantages over similar materials. Breathable – Muslin has an open weave that allows airflow. Used for projects that require lightweight fabric, clothing or blankets. Used in Several Industries – While clothing or knitting is a common industry for muslin, it seems to be used in many other industries. Muslin is used in fine woodworking to apply finishes, and in the kitchen for filtering. Even beekeepers use muslin to separate debris from their beeswax. It’s an extremely versatile fabric that has uses in infinite industries. Easily Dyed – Whether you’re using muslin for costumes, clothing, or backdrops, you will be able to dye it with ease. Easy to Sew – The open weave of muslin makes it very workable for a variety of projects. 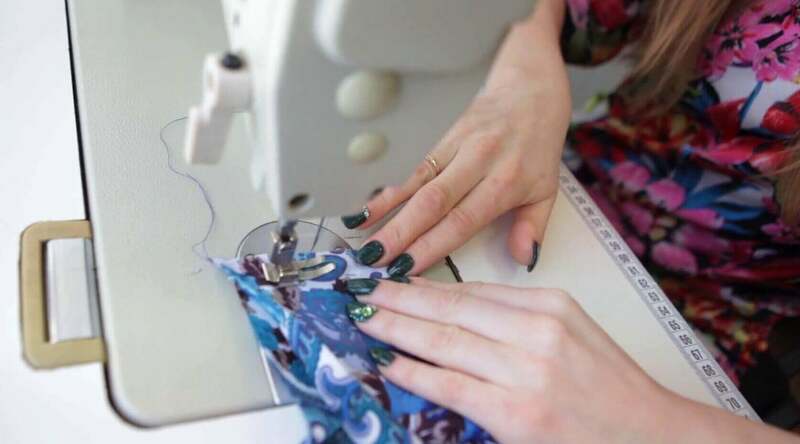 Sew it by hand or with your machine for your next hand-crafted project. Affordable – Probably one of the best advantages of muslin: it’s affordable! Use it for tons of sewing crafts. It also means your theater production don’t have to break the bank on set design. Canvas Etc. offers many different types and sizes of muslin to meet your needs. We know that you need quality, and a fabric to last a lifetime. That’s why we pride ourselves on having truly premium material. 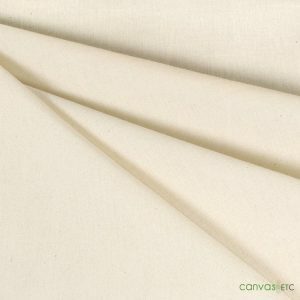 Whether you’re looking for fabric to create your sets with, or if you’re looking for a filter for decanting your fine wines, we are sure to have all your muslin needs at Canvas Etc. For any questions or concerns about if muslin fabric is right for you, contact our expert professionals. 100% cotton muslin, 5 oz/ sq yd, natural sold by the yard or by the bale. Fabric is shipped folded and may require slight steaming or ironing to remove creases. Washing the fabric will cause it to shrink of about 8-10%.